Neighbor offered me some fresh-caught Gulf brown shrimp and Snapper throats recently. I stuffed the larger shrimp with a mixture of seranos, cream & manchego cheeses and chopped cilantro, then wrapped each in half a slice of bacon. These were set on the cooler side of the Hasty-Bake, away from the fire. I also used the left over stuffing on some jalepenos and wrapped them in bacon to join the shrimp. The throats were simply prep'd with some home-made "Old Bay Seasoning" that to me wasn't a good knock-off at all. Years ago I recall using "Chesapeake Bay Seasoning" and really liked it, but evidently it's no longer made. When the shrimp & poppers went to the hot side to crisp the bacon, the throats went on the cool side to slowly cook & absorb some pecan smoke. Needless to say, the final results were delicious and quickly consumed with some chilled white wine and a few cold beers. It's mighty hot this time of year outside grilling! Next, what to do with the smaller shrimp? Not a big fan of boiled (boring) shrimp and never liked that 'cocktail' dressing. It's been decades since I fried anything however, I also ran across an old, old recipe for home-made onion rings. Therefore, I decided to fry both. I quickly discovered my Williams-Sonoma quick temp gauge wouldn't read above 250�F. I couldn't find the old candy thermometer either. (Might have cracked it years ago & tossed it). Then I remembered the IR thermometer. Didn't have one last time I fried. I used an entire quart of fresh corn oil in a 12" skillet, heated to about 370�F. This gave me about 1-1/4" oil depth. The big skillet allowed me to use the large electric coil heater to evenly distribute the heat. While cooking multiple batches, I kept the finished in a 200�F oven on a wire rack to let the oil drain without sogging the bottom crust (a pet fried peeve of mine). 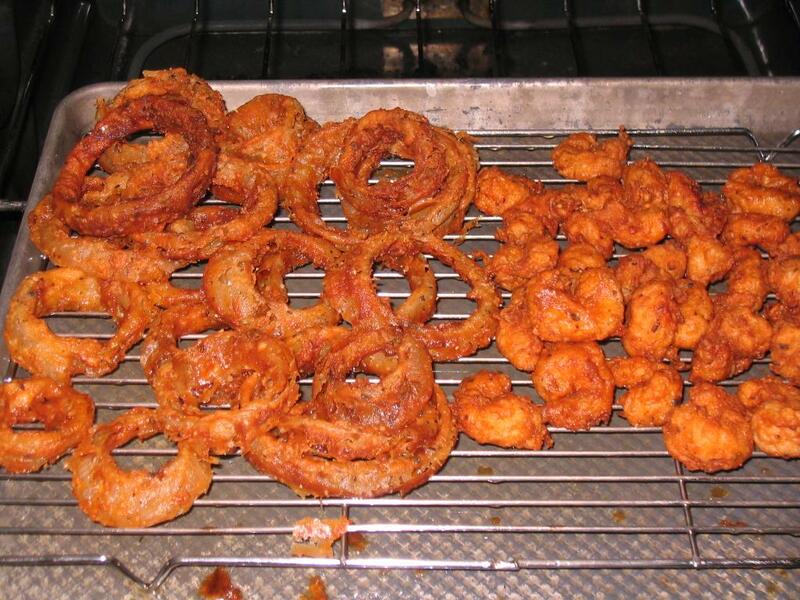 I'd forgotten just how good home-made onion rings & fresh, fried shrimp were!! Wow...the crust was very crispy, flavorful but didn't get in the way of the clean, fresh taste of the shrimp. Nor did I use tarter sauce...that'd be a waste on such good shrimp. The onion rings had a shatteringly crispy crust, with great onion flavor. It's so difficult to find excellent o-rings where I live. What a shame. I won't near as long to make the onion rings again! They'd go great with steak as well. Any oil-heads here regularly fry shrimp or o-rings? My wife and I call in an order for one Blooming Onion at Outback steak hose once in while. They are so dang good. The only acceptable substitute for McCormick's Old Bay Seasoning is J.O's #1 Seafood Seasoning. Been a few months since wife made home made onion rings. Wish I'd seen this earlier, could had asked her to make some but the tri-tip on the grill with smoking chips is about to come off the grill. Going to slice it to make sandwiches & onion rings would go well with it, but she already made potato salad. She smoked a load of salmon earlier today in the smoker and I probably had more than the law should allow. I better not push it - will probably mention home made onion rings after dinner which will probably results getting it in a day or two. Growing up in the northeast, I've never heard of Snapper Throats. Had to google it to figure out what you had. Good job, I grilled some marinated chicken thighs today under a patio umbrella and almost died, its very hot today. Call me next time. I will bring the Shiner. Funny, I only ever heard of fish throats this week on the cooking Channel. Apparently they emerged as a "peasant" food, that could be harvested from fish heading to sale and not affect the sale of the fish. Purchased some Chesapeake Bay Seasoning at the BWI air port on my last trip. Thanks for the link. I did do a bit of reading and discovered the history behind "Old Bay", then McCormick bought them, some swore 'not as good'. My cousin also used and liked Chesapeake seasoning, before it was removed. Being a confirmed spice-a-holic myself, I'm keen on seasonings. A great one is quite rare. Far too many are just salt (cheap), MSG with a few bits-&-pieces thrown in for $5-10/bottle. Prudhomme's are consistently fine & stand out from the bunch. I had two small bananas. I think they were .21 at Walmart this morning when I was buying Gumout Octane Booster for $2.24. But yes those scrimps look excellent! Last edited by SatinSilver; 08/13/17 04:33 PM. You guys ought to look up the recipe for "Cast Iron Calzones" from America's Test Kitchen/Cook's Illustrated/Cook's Country. Sign up for their free trial, set a calendar alarm, then download recipes you like, like crazy. You'd be amazed! his cast iron pizzas where looking good.